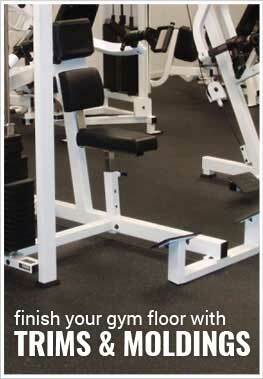 Description - Our heavy duty commercial rolled rubber flooring is the highest quality rubber gym flooring available. 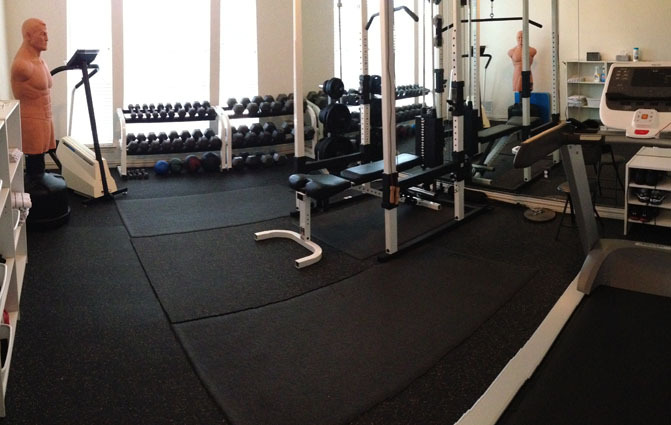 It is built for extreme durability and can be found in many commercial weight rooms around the United States today. The rolls are machine cut for exacting standards and are easy to install. These rolls can be used indoors and out. Material – Recycled rubber buffings and colored EPDM virgin rubber flecks. Rubber buffings are the “Filet Mignon” of the recycled rubber industry since they are the cleanest, strongest, and most consistent raw material as compared to some of the discount recycled crumb rubber alternatives available. Weight – 2.2 Lbs. per square foot. Recommended Uses –Heavy duty rubber rolls have been used successfully as home gym flooring, as commercial weight room flooring, under exercise equipment, in pet care facilities, as basement flooring, over radiant heated flooring systems, on outdoor patios and decks, as slip resistant flooring on boat docks, as children’s play room flooring, in locker rooms, and any other place where a rubber floor solution would be useful to help prevent slipping and provide anti-fatigue and sound control qualities. 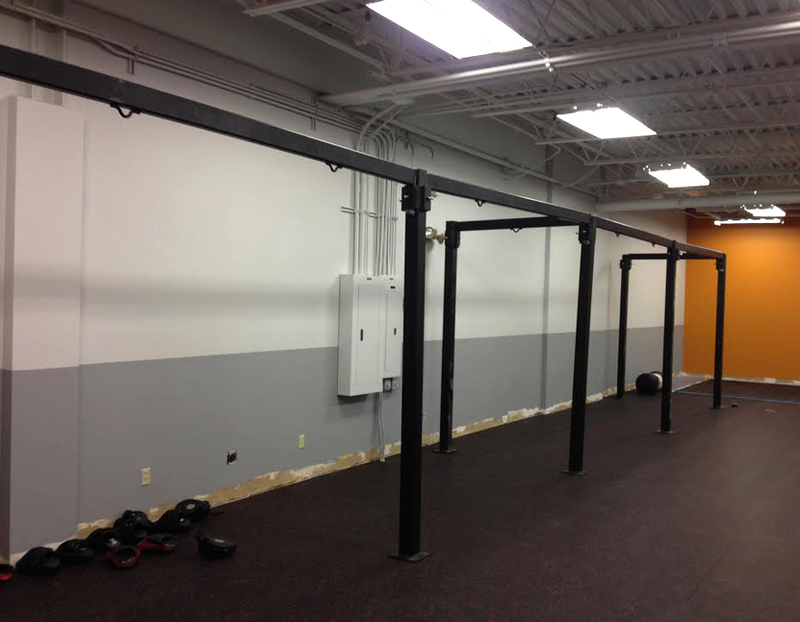 Perfect for commercial gyms and weight rooms. 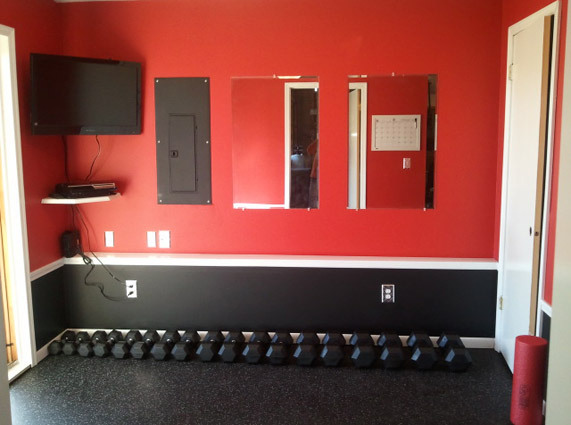 Highest quality rubber gym flooring available. Industry leading 5 yr warranty. Rolls from our West Coast facility may take 7-14 bus. days to ship out. Would this mat be too soft to dribble a basketball? I'm looking for a floor where the kids can dribble in the house. Our rubber rolls are very dense and will allow a basketball to bounce the same as if the flooring were hardwood. What is the best way to clean your 3/8" Heavy Duty Rubber Rolls? Our 3/8" Heavy Duty Rubber Rolls are very easy to clean. For dirt we suggest using a broom or vacuum. When mopping the rolls, we suggest using a synthetic mop head with a mild soap and water solution. Can this flooring be used in the aisles of a horse barn? Our 3/8" Heavy Duty Rubber Rolls can be used in the aisles of a horse barn. Will it mildew on concrete floor in the basement. Our 3/8" Heavy Duty Rubber Rolls are resistant to mold and mildew growth. The only time mold would ground it if there were foot stuck on the floor. Can the 3/8" rubber flooring be installed over a tight knit commercial carpet that is approximately 1/4" thick that was glued to concrete? I don't want to have to tear up the carpet and clean off the concrete floor if not necessary! The area in question is about 45' long x 21' wide. Thanks! Our 3/8" Heavy Duty rubber Rolls can be placed over 1/4" thick commercial carpet. 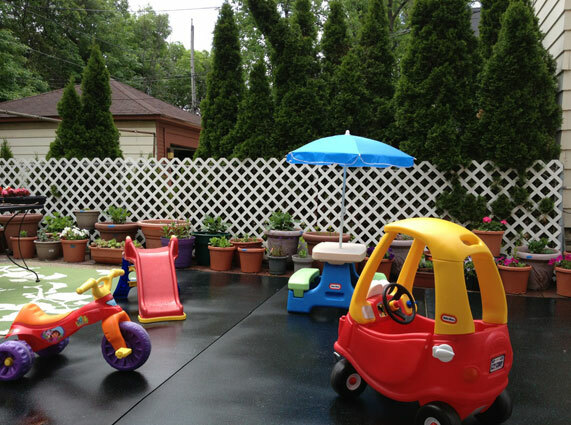 Under our rubber flooring, we recommend that the surface underneath be flat and solid. The only surfaces we don't recommend placing rubber flooring over are vinyl and plush carpets. Here is a pic of our installed flooring...turned out very well and I am highly pleased. I bought three 4' x 10' rolls of 3/8" heavy duty rubber to put over our concrete patio to make it safer for the kids to play out there. It is great for this purpose and the kids love it. I ordered 5 rolls that were 4' x 15'. Order shipped on Tuesday and arrived on Thursday via FedX. Each roll was individually wrapped...the entire pallet was covered in clear plastic...strapped down well...and in perfect condition. I replaced the 16-year-old commercial grade carpet in my 19' x 14' workout room on the first floor of my home (concrete slab floor). I moved the rubber rolls one at a time into the workout room using a dolly with no problem. I purchased 2 each 1/8" thick 2' x 4' hardboard sheets and had Home Depot cut them in half so I ended up with 4 each 1' x 4' hardboard strips. I used a 48" heavy duty T-square and a Grey fine point Sharpie to mark the rubber. I measured twice (sometimes more)...and marked the rubber using the Grey Sharpie. I placed the hardboard strips underneath the rubber where the cut would be so that when the knife blade went through the rubber it would then be cutting against the hardboard...NOT the concrete. I used the T-square as a guide and placed a small foam knee pad on top of it while I kneeled on it (this helps hold the T-square in place). There is a sticker on one side of the roll which says "This Side Down". I cut the very end off of each roll to ensure it was perfectly square. I used a Dewalt utility knife which provides a good grip and excellent pressure angle. It takes 3 or 4 cut passes to get all the way through the rubber. The 3/8" rubber fit perfectly under the baseboard all around the room allowing me to tuck 1/2" of rubber under it on all 4 walls. Note: make sure you measure each section from wall to wall where each roll will go. There can be up to 1" variance even though the wall "looks" straight. Measure twice...mark and cut once. The actual installation of the flooring took me 4 hours. The product is easy to install...but it is high-quality, "heavy" duty stuff. I installed the rubber flooring by myself without any help...but I am a large and strong man with a lot of construction/moving experience. If you are not a very large/strong person and you have fairly long runs...you will probably need some help moving and positioning the product. I could not be more pleased with how the installation went. It lays and fits perfectly and looks fantastic! Great product, price & customer service!! Love my new home gym. The flooring made the room!